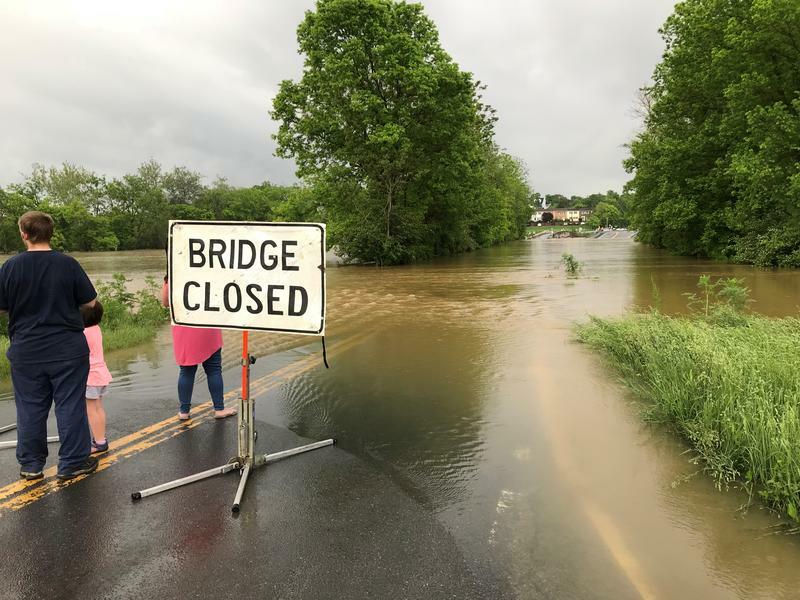 The Opequon Creek that borders Berkeley and Jefferson Counties has completely flooded a bridge in Martinsburg near Grapevine Road. Photo taken on May 17, 2018 at 7:22 p.m.
Down at the boat ramp in Shepherdstown, W.Va. along the Potomac River; expected to hit flood stage by Friday night. Photo taken on May 17, 2018 at 4:30 p.m. Between 4 and 9.5 inches of rain fell on counties in the Eastern Panhandle last week. No substantial damages or injuries have been reported -- though there were three vehicle rescues in Berkeley County. As of 4:30 a.m. Monday, Jefferson and Berkeley County authorities said all rivers are now out of flood stage, and any water still on the roads is minor and will likely recede within the next few days. 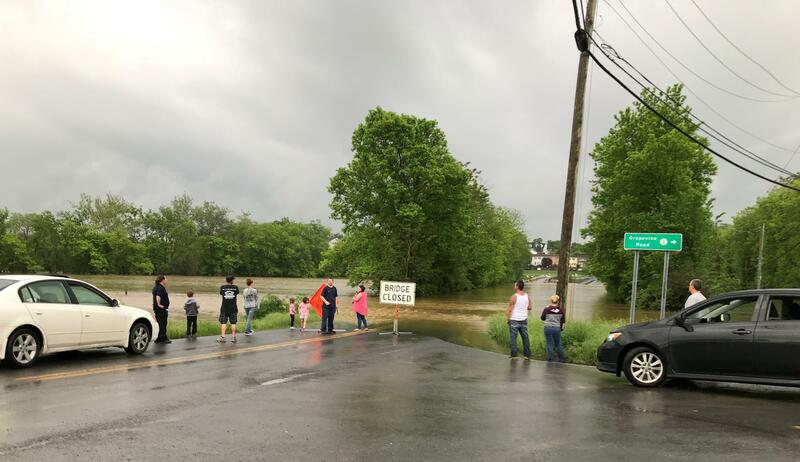 The Opequon Creek and the Potomac and Shenandoah Rivers in Berkeley and Jefferson counties had been at risk of flooding for four days in a row. All roads in Berkeley and Jefferson are now open, and the Opequon Creek has receded off of a bridge in Martinsburg. Emergency declarations were made in Berkeley and Jefferson counties after four days of storms last week. Updated on Sunday, May 20, 2018 at 3:15 p.m. Flood warnings continue along the Potomac River in West Virginia's Eastern Panhandle after several days of heavy rains. 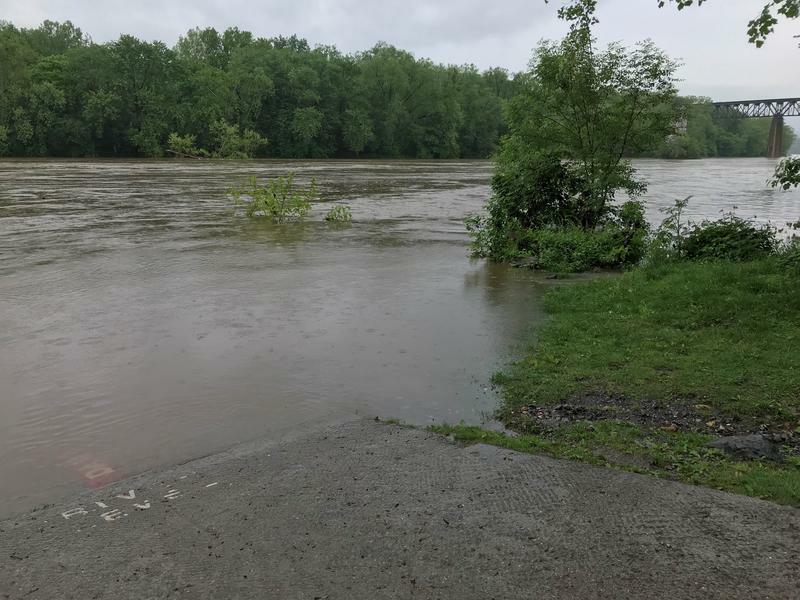 The National Weather Service says the river at Shepherdstown was more than 2 feet above flood stage Sunday morning and was expected to fall below flood stage by Monday morning. Opequon Creek near Martinsburg was about a foot above flood stage Sunday morning and was expected to fall below flood stage by Sunday night. Flooding caused several road closures in the area. Emergency declarations were made in Berkeley and Jefferson counties after four days of storms. Updated on Saturday, May 19, 2018 at 1:34 p.m.
A flood watch for Berkeley, Jefferson, Morgan, Hampshire, and Hardy Counties remains in effect through 8:00 p.m. Saturday evening. The National Weather Service reports a flood warning for the Opequon Creek near Berkeley and Jefferson Counties remains in effect through Sunday afternoon. The creek still covers a bridge in Martinsburg and some nearby lowlands near the Van Metre Ford Pedestrian Bridge near Grapevine Road. The bridge remains closed. Use caution when traveling in this area. There is a flood warning still in place for areas of the Potomac and Shenandoah River through Monday morning. Certain roads in Berkeley and Jefferson Counties remain closed due to flooding. Updated on Friday, May 18, 2018 at 11:10 a.m.
A flood watch remains in effect through Saturday morning for parts of the Eastern Panhandle and Potomac Highlands, including Berkeley, Jefferson, Morgan, Hampshire, Hardy, Grant, Mineral, and Pendleton Counties. The National Weather Service is reporting periods of rain will continue across the region through at least Friday night. Rain could be heavy at times and bring additional rainfall of 1 to 5 inches in some areas. Jefferson County Homeland Security and Emergency Management noted on its Facebook page that the Opequon Creek near Martinsburg was in moderate flood stage Friday morning but is expected to crest again at nearly 14 feet by Saturday afternoon. Due to week long bouts of rainfall, the Opequon Creek covers most of a bridge in Martinsburg near Grapevine Road and has flooded nearby fields. Photo taken on Thursday, May 17, 2018 at 7:21 p.m.
Several roads in the area remain closed and nearby lowlands are flooded. The Potomac River in Shepherdstown and Harpers Ferry are in minor flood stage and expected to crest at nearly 20 feet by Sunday morning. The Shenandoah River at Millville is expected to be in minor flood stage by Friday evening and is expected to crest at 12 feet early Sunday morning. A flood warning is in effect for the Opequon Creek and the Potomac and Shenandoah Rivers. A State of Emergency Proclamation was signed by the Jefferson County Commission on Thursday evening. Continuous rainfall has been affecting parts of the Eastern Panhandle since Monday. More rain is expected through the weekend, and a flood watch remains in effect for Berkeley, Jefferson, Morgan, Hardy, Hampshire, and Grant Counties. Since Monday afternoon, 4 to 6 inches of rain has fallen in the Eastern Panhandle and nearby areas. The National Weather Service is calling for another 2 to 5 inches over the next 48 hours. Listen to the story from May 17, 2018 at 4:00 p.m.
A flood warning for the Opequon Creek, which borders both Jefferson and Berkeley Counties, is in effect until further notice. The Potomac and Shenandoah Rivers are expected to be in flood stage by Friday evening. Brandon Vallee is the Public Information Officer for Jefferson County Emergency Management. He’s encouraging residents to stay alert and be careful if traveling over the next few days. “If you do see water on the roadways, we have had several reports of culverts washed out or damaged roads, so if you can’t see the bottom of the road, turn around, don’t drown. It’s not worth it,” he said. Vallee and Berkeley County Emergency Manager Randy Lilly say there have been no evacuations so far in either Jefferson or Berkeley Counties, but several roads have been closed. Residents are encouraged to make sure they have food and supplies to last for the next 48 to 72 hours.